When presenting a quitclaim deed to the county auditor in the state of Washington, it is required to be in writing, signed by the parties bound to it, and acknowledged by a person who is authorized to take acknowledgments. Additional formatting requirements will apply to a quitclaim deed. If a quitclaim deed that relates to community or separate property includes a description of real estate that is described by lot and block or addition or plat, it will not be admitted to record until the plat of such an addition has been made a matter of record (RCW 65.04.30). In order for a quitclaim deed to be valid against a later buyer who purchases the same property in good faith and for a valuable consideration, it must be recorded with the county auditor in the county where the property is situated. The priority of a quitclaim deed is determined by the order of recording. 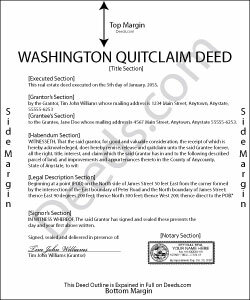 In the state of Washington, the moment a quitclaim deed is filed for record, it is considered recorded. Dale A C. said: Deeds.com was a very efficient and simple website to use in preparing my documents needed to complete a real estate closing. I highly recommend this website, as it is easy to use, inexpensive, and effective. Ute P. said: Thank you it was hard for me to pull these documents online you been a big help since I am in a different state, quick and awesome. Reply from Staff: Thank you for your feedback. We really appreciate it. Have a great day! Susan A. said: Very convenient. Instructions and samples are a plus because I often see documents incorrectly completed. Take the time to do it right. Rebecca Q. said: Very helpful! Unfortunately, they didn't have what I needed, but they got back to me quickly and didn't charge me anything. Easy to work with. Gladys B. said: Good and fast service. Thank you.